Anglim’s Western Metal Works has been part of the Albuquerque community for a long time – and we are dedicated to helping New Mexico public utilities stay online and ready to go at all times. That’s why we offer full-service welding and fabrication throughout the state, from shop fabrication to field installations and on-site repairs. Our welding shop is staffed with experienced, knowledgeable welders, and we have the expertise and machinery necessary to tackle specialized jobs. We have aided public utility companies throughout the state and are happy to offer ongoing support for welded components to ensure functionality and longevity. If you are a New Mexico utility company or a contractor working on public utilities, count on us to provide quality welding and fabrication services. Our workmanship sets us apart from the competition: We invest in the highest quality tools and inspect every cut and weld to ensure precision, accuracy, and strength. You can see more of our completed projects here – or just contact us for more information. 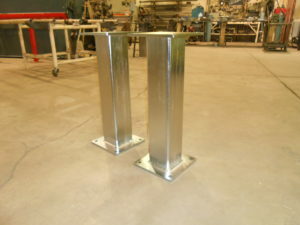 We’ll be happy to provide a quote for service or answer your questions about our available welding and fabrication services. Call 505.822.9170 to learn more about our welding services.